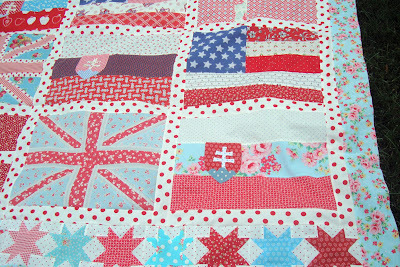 I've been working all year to make my 2011 Personal Flag Quilt that represents me and my family heritage. It's been a joy to explore my family history and the flags from those countries. 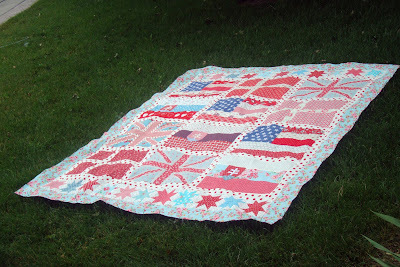 I was inspired by Amy and her Union Jack blocks and her several flag quilts. And I'm really happy to have finished my flimsy! I've worked on this project just in the background of other quilts and bags. It has evolved without a clear picture of what I wanted the finished project to look like. Adding the little stars was something I thought of mid project. I really like how it turned out and now I can't wait to get it quilted. Figuring out what quilting pattern that will compliment the flags and stars is my next step. The quilt ended up bigger than I thought it would be but I'm happy with the size at this point. It is in between a full and queen sized quilt. I like all the different colors of red and blue in the quilt. My Union Jack, USA, Danish and Slovakian blocks seem to all work together. I love the dots, too. I used fabrics that really speak about my perspective and that enhances the personality of the quilt for me. Thanks to Amy for inspiring me. Isn't it great to open up an Internet page and be transported into a project that brings passion and joy. it's gorgeous! i love every piece of it! How absolutely wonderful this turned out - I just love it! The fabrics and colors just blend so well. Love the added star blocks. What a fun and personal project. I love it sew much!....the stars are perfect in there...just the right touch to finish it off. I'm happy you have it finished now and the quilting will just make it even cuter! You are such an inspiration! 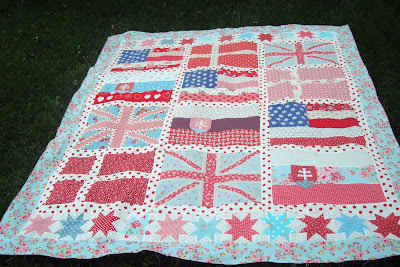 I now want to make a heritage flag quilt too! I love the addition of the stars. Perfect. This is wonderful! I knew it would be, but once again I'm blown away with the completed quick. 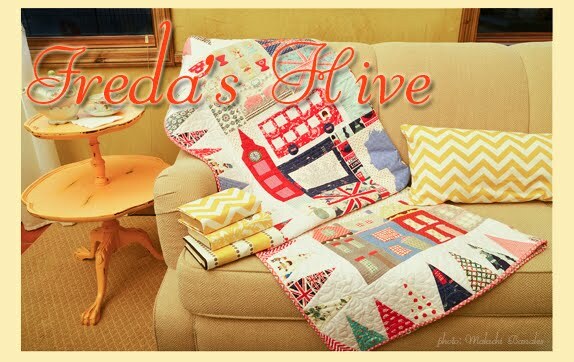 Love the colors and really love the sentiment behind the quilt. Those stars are absolutely perfect! It'a a fabulous creation. Well done. I hope you'll show us the quilting too. Uhhhh... 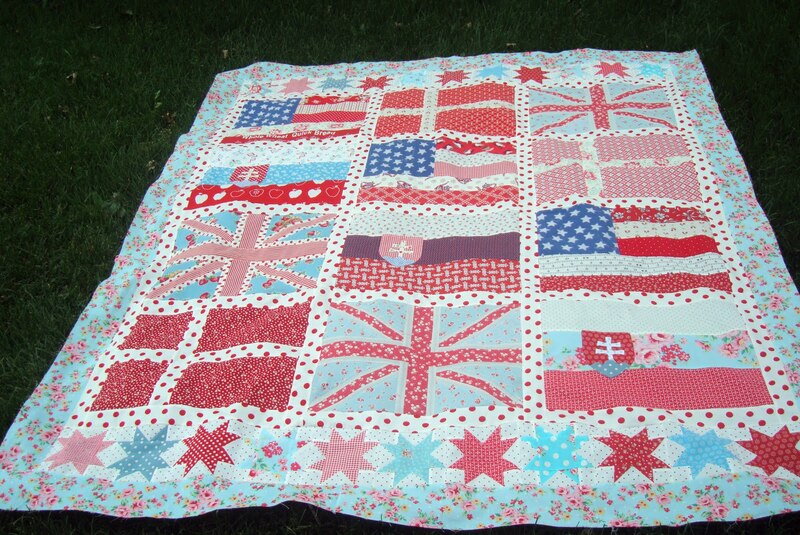 I see a Danish flag there :) love your quilt and the personal story it tells. I am in LOVE with your quilt!!!! Super job! Nanette, it is so beautiful! I totally want to do this for our family now! What a great idea! Beautiful and so full of wonder. It's really nice Nanette. What a beautiful history piece for your family. I've loved watching your progress on this in the background ... it's lovely! I love it!! This is a great addition to your family history. Now I want to make one. I love your blog! I learn so much! wonderful colors! what a neat project! You've inspired me, Nanette! This is a gorgeous quilt and such a wonderful idea. That is just stunning Nanette! A true gem. oh wow I like that alot. I love how it all works together. I would not have dared mix up the colors of blue you did it turned out great. Nanette- It's beautiful! What a treasure you have made. Man, I need to get crack-a-lackin' on mine! oh I do like that...a lot! 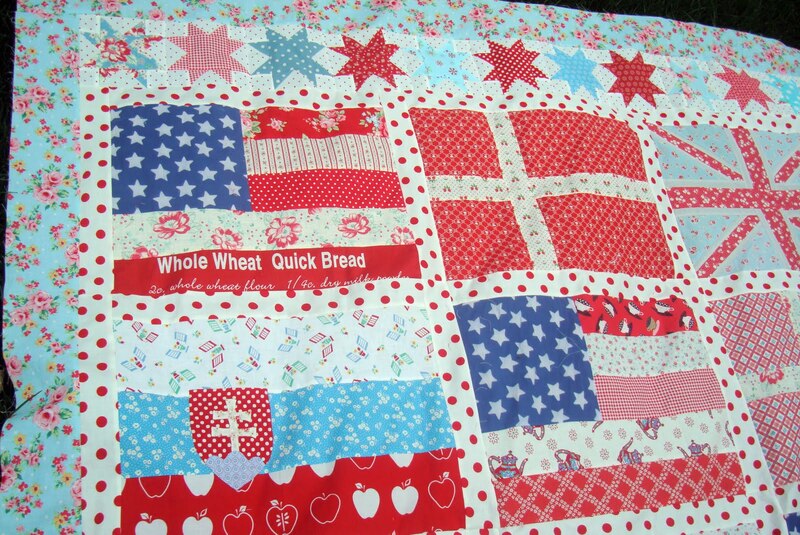 Gorgeous quilt ... love the red and blue fabrics. How beautifully it turned out! Quilts are so personal anyway, and this one is just ultra personal for you. 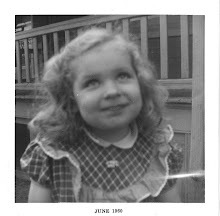 How neat to be reminded of your family history every time you see it, and it looks so like you, too. Love, Love, LOVE Nanette! It's gorgeous. And except for the Slovakian flag, we share the same flags. I need to get to work on mine! Thanks for the inspiration -- funny how it just rolls downhill, huh? Wow!! I LOVE it for sure!!!! I especially like the sweet floral border!!! I just love this quilt, Nanette. Can't wait to see it quilted. The addition of the stars is the perfect touch. Your colors are awesome! Love your flag quilt. So pretty. Congratulations! I just love how this turned out - what a lovely and special quilt for you. It turned out great and you can share all the history with your grandchildren one day. What a treasure! Will this count as family history done, for life?? What a fun stroll through your family history--and the fun is reflected in your color choices, prints and dots. Wonderful. Congrats, Nanette! Your flag quilt is wonderful! All the details you've so thoughtfully put into the design and choosing the fabrics makes it so special and precious! 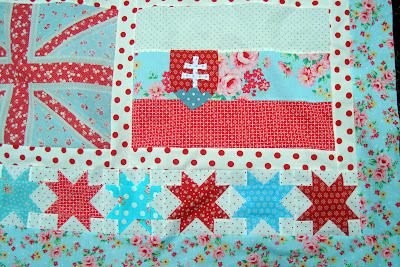 Love love love the red dots in the sashing... It is so fun! That is a very cool quilt! And what a fun blog...I'm not in UT anymore, but grew up about 3 blocks from Broadbent's so it was fun to see that on your sidebar! Eeeek!! I just love it!! What a fabulous job you did in representing your heritage.